Dallas billionaire Tom Dundon, owner of the Carolina Hurricanes of the NHL, has assumed the chairmanship of, and a majority stake in, the fledgling Alliance of American Football league…and all it cost him was $250,000,000. Such a deal! Earlier rumors of financial instability in the AAF were quickly and quietly put to rest with Dundon’s input. Of course it’s an investment, albeit a risky one, and Mr. Dundon fully expects to make a profit at some point. Still, that’s a lot of money to put down on a bet. He did get a fancy new Alliance of American Football business card which carries his new title of ‘chairman’. It remains to be seen what else comes with that little card. Tom didn’t get in the position of being able to invest a quarter of a billion dollars in anything by being dumb or naive. Dundon stated on a local Raleigh, North Carolina sports program, “My investment should keep this thing viable for years and years to come”. In 2017 he put down $420 million to purchase the Carolina Hurricanes of the National Hockey League along with PNC Arena in Raleigh where the Hurricanes play. That’s $670,000,000 folks! The man must like sports a lot. Actually, Tom Dundon didn’t just show up at the AAF front offices and plop down $250 million bucks. It is more like a commitment up to that amount. He did not even discuss the investment until he saw the AAF actually play some televised games and look like a viable proposition. Now he plans on incrementally investing in the Alliance with the 250 being what amounts to his max at some point. 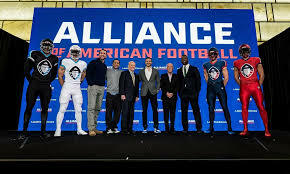 Charlie Ebersol, who put the AAF together from the beginning, has admitted that the league almost didn’t get to the first game due to ‘various complications’. In the beginning he had “plenty enough commitments to last a long time, but maybe not the money in the bank”. That problem now seems to have been taken care of and the AAF seems like it’s off to an auspicious beginning. Scott Butera, MGM’s director of interactive gaming, has announced that MGM Resorts International has also made an investment in the AAF tech platform and now has a 3 year agreement to be the leagues official sports betting sponsor and exclusive gaming partner. This marks the first time ever that any sports organization has sold exclusive in-game betting rights to a sportsbook of any kind.